Creating some of the buildings on my layout in Clay has caused me untold nightmares. But then über-model maker and photographer Chris Nevard came to the rescue. While I have no doubt that creating the some of the buildings on my model railway in Das Modelling Clay (I use the 1Kb packs here) was the right decision I couldn’t make the Clay work for me when constructing the larger buildings of the Tin mine. Attempt after attempt failed with the clay deforming, cracking or breaking. 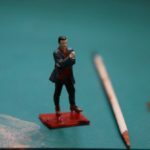 Then, I came across an article by Chris Nevard where he explains how he creates his clay models. 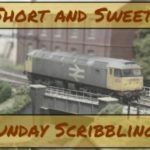 I’ve long admired his work and the article (in an old copy of Model Rail magazine didn’t disappoint. Even better, not only did he explain his technique but he used a Cornish mine as the demonstration model! It couldn’t get much better! There in print, alongside photographs of his superb models to motivate me, was the answer to my clay conundrum. Thank you Chris!! In the past, when building Clay models, I create a wood frame for the shape required and press the clay into this. This gives a slab of the width, height and length needed and into which I can scribe the stonework detail before removing the frame and leaving it to dry. This has always worked and I’ve built a lot of small buildings, stone walls and peripheral structures using it but the substantial walls of the mine buildings required the thick Clay and this caused problems. As I pressed parts of the walls other areas would push out causing an uneven surface. Even worse, the large expanses of the Clay proved vulnerable to breaking while I was working on them. After multiple tries, all I had to show for my efforts was a workbench with scattered bits of deformed and broken Clay. The technique Chris outlined solved both these problems. Essentially, he made a shell for the building in foam board (available here). Onto this he then glued and pressed the Clay, creating an outer skin into which he scribed the stonework. This approach is so much better. 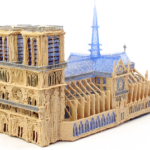 As the clay is thinner – he suggests a layer a few mil thick – it’s easier to work with and as the Clay is supported by the foam board it won’t distort as it is pushed and pressed. A Cornish chimney, note the round shape and taper. The only problem with this is that Cornish mine chimneys are usually round in shape. This can be seen in this photo of a typical Cornish chimney – this one is at the Wheal Martyn China Clay museum which I visited earlier this year on a fact finding mission*. Round shapes of course can’t easily created using flat square foam board. Instead I’m using a candle as the shell on which to shape the Clay. Not only is this round but also tapered as per prototype the chimney – seen to the right. Once the Clay dries and the stonework is carved, the candle can be removed – gently – leaving the hollow centre. Extra detail is easily added later with more Clay. With these techniques my Clay conundrum is solved and I get to return to my beauty sleep safe in the knowledge that my nightmares are gone. > Read more about the wonderful trains, models and photographs of Chris Nevard on his blog here. * Yes,if you’re wondering, that’s me in the foreground.